Source Patrol 35L Hydration Cargo Pack Combat/Tactical Hydration Backpack: The Ultimate 3-Day Pack! | DefenseReview.com (DR): An online tactical technology and military defense technology magazine with particular focus on the latest and greatest tactical firearms news (tactical gun news), tactical gear news and tactical shooting news. In my quest for the perfect assault pack, my endless internet searches have led me to requesting a Patrol 35L Hydration Cargo Pack from Source. 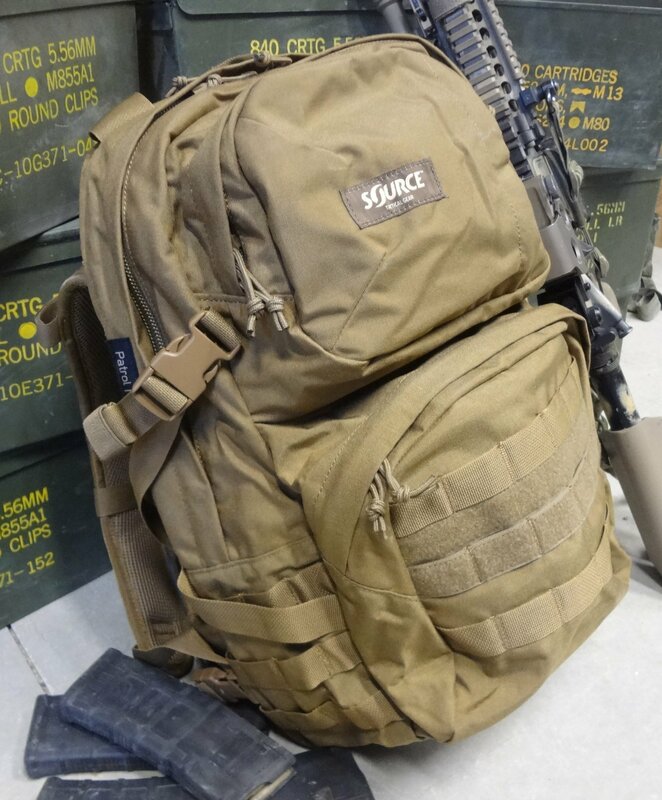 What interested me with Source packs (tactical hydration packs) to begin with is from the looks of their packs on their website, they looked like they sit well over body armor. 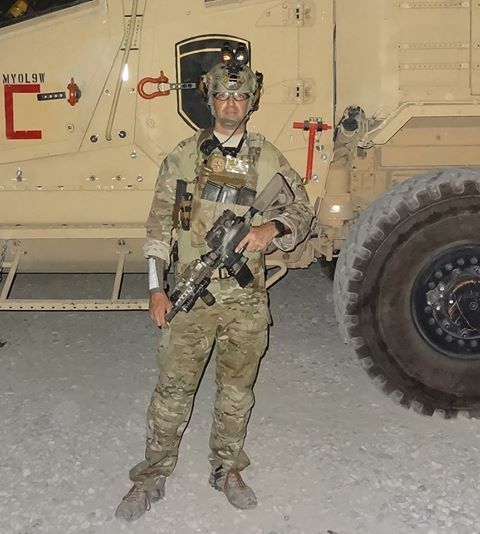 If you remember my piece from my previous deployment last year; Top Tactical Gear Picks for Deployment: A U.S. Military Special Operations Forces (SOF) Perspective, the pack I was using felt horrible while wearing it over body armor, in terms of comfort. The last thing you want is some soul-sucking pack on your back draining the life out of you with every step. If you look at assault packs or any combat/tactical packs (backpacks) that are designed to be compatible with body armor, the approach most often taken is the addition of some pads to the back of the pack, (one offset on each side). The pads help the pack to sit evenly on the generally flat surface of the body armor. Source Patrol 35L prior to loading it up. Pack consists of a bladder pocket, one large main compartment, two medium size outer pouches, and a small admin pouch on the outside of the top pouch. 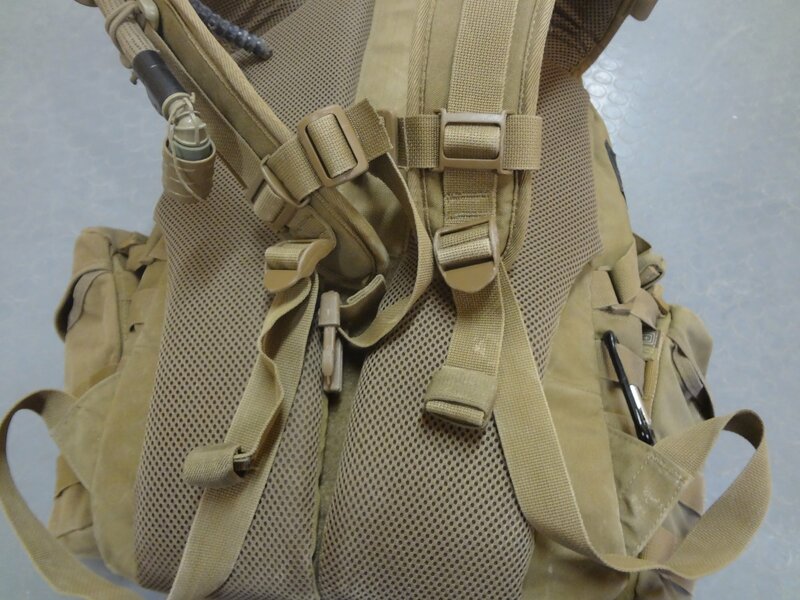 While the Source Patrol 35L Tactical Hydration Cargo Pack does not have these offset pads, what got me interested in this pack is how the shoulder straps are attached to the pack (more specifically where they attached them to on the pack. Looking at why my last pack felt so bad with body armor, one the biggest reasons was how the shoulder straps were attached directly to the top of the pack. When loaded down, the pack always hung super low off the shoulders, even with the waist belt worn. Over body armor, it was even worse. 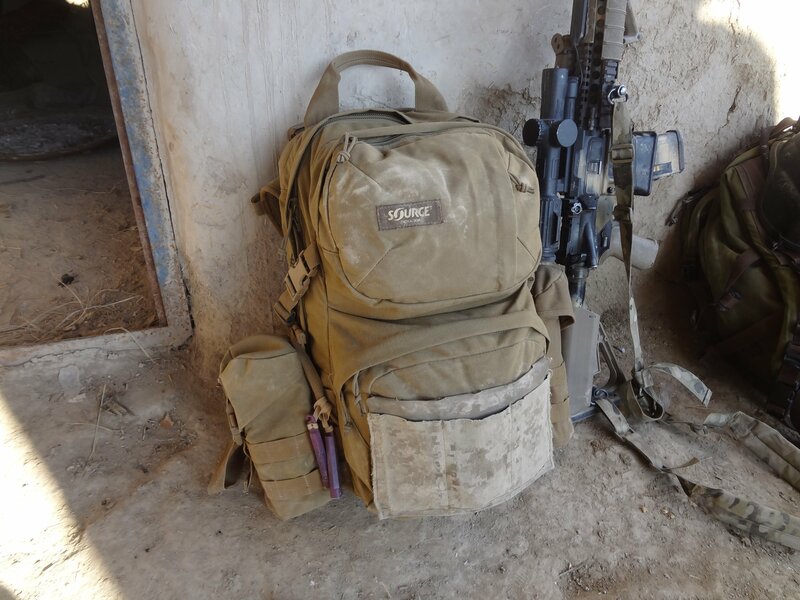 It seemed as if the pack was just pulling on the back of my plate carrier, hanging so low and causing the shoulder straps to really dig into my shoulders (making for a generally miserable experience). It’s all in the shoulders! 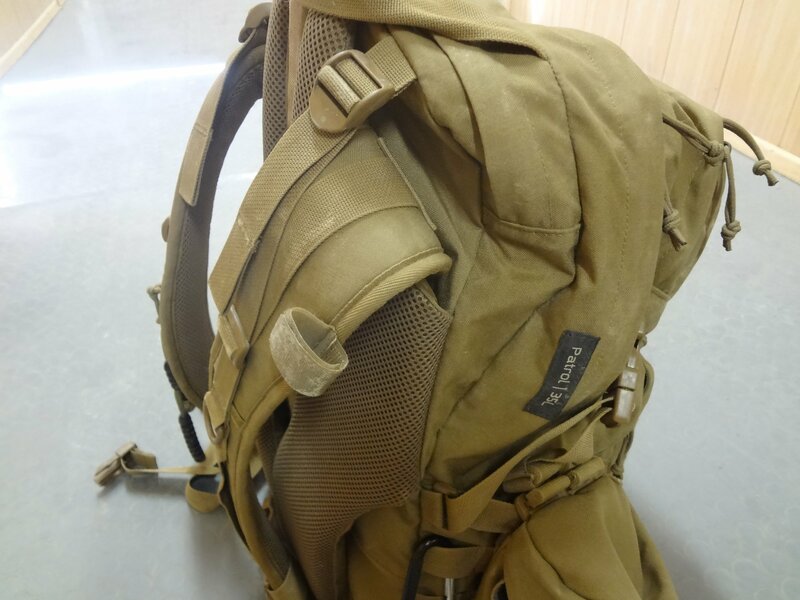 The shoulder straps of the Patrol 35L are attached offset down from the top of the pack. So, even when fully loaded, it helps keep the weight up high and not dragging straight down off your shoulders. When worn over a plate carrier, the shoulder straps stay more towards the center of your chest, and not on the edges of your shoulder blades. The result: the Patrol 35L stays pretty well centered on your back plate, distributing the weight pretty evenly across your back and shoulders. Having used it now on a few 24hr operations with body armor and a full combat load, I have to say it is now my favorite assault pack. The shoulder straps attach to the pack a few inches below the top of the pack. This method keeps the pack from sagging down on your back and pulling your shoulders. Out and about, Patrol 35L worked well even over a plate carrier and full kit. The Source Patrol 35L Hydration Cargo Pack is comparable in size to most other 3 Day packs. With one large main compartment, two outer pouches and a reservoir/bladder pouch (WLPS 3L Low Profile Hydration System 3-liter reservoir/bladder included with the pack.) The top outer pouch has two dividers inside it, with small pockets for pens and other items. There is an additional small pocket on the outside of the top pouch. The bottom large outer pocket has three rows of MOLLE webbing with that have six slots. I think this is important to point out because a lot of other packs have only five slots, making it impossible to mount a triple mag (5.56mm AR-15/M4/M4A1-type rifle magazine) carrier/holder. The Patrol 35L has a unique strap system to cinch down the sides of the pack. Where most packs of this size have two individual compression straps per side, the Patrol only has one per side. Because of the way it weaves from the bottom of the pack to the top, when you pull on the single end, it tightens down the entire length of the side, compressing the pack. I should also mention the back of the pack is well-padded and is reinforced via a single internal bracket running down the center of the pack. 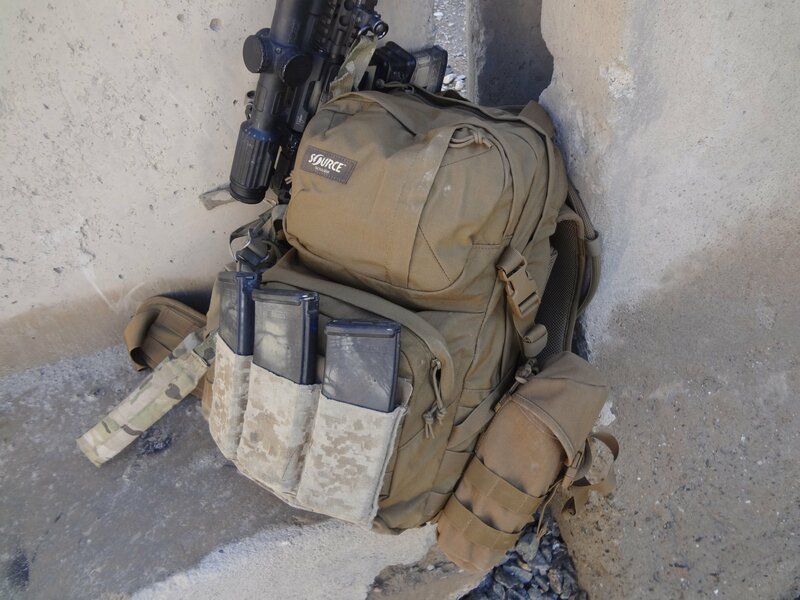 The padding is offset from the center of the pack, thus not allowing the bracket to touch your back, and it being offset left and right does help keep the pack center on your back or plate carrier. The back of the pack is well padded and is reinforced with a single cross bar running down the center between the padding. I found it to be very comfortable. It rested evenly, and did not shift around while worn over a plate carrier. The color of the pack is Coyote Brown/Flat Dark Earth (FDE). It is the same shade of coyote brown used by most U.S. manufacturers of tactical gear. Right off the bat, when I got the pack, I attached two 5.11 Tactical brand coyote brown/FDE (Flat Dark Earth) H20 Carrier Nalgene bottle pouches to the sides. I cannot tell the difference in color. Another feature with the Source Patrol 35L is the detachable waist belt. The waist belt itself is actually pretty robust and does a great job supporting the pack, and placing the weight on your hips (where you want it not on your shoulders!). 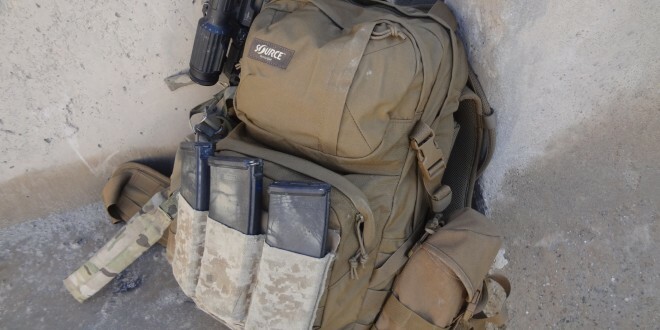 Being able to take off the waist belt is a necessity for any pack intended for tactical use, in my opinion. 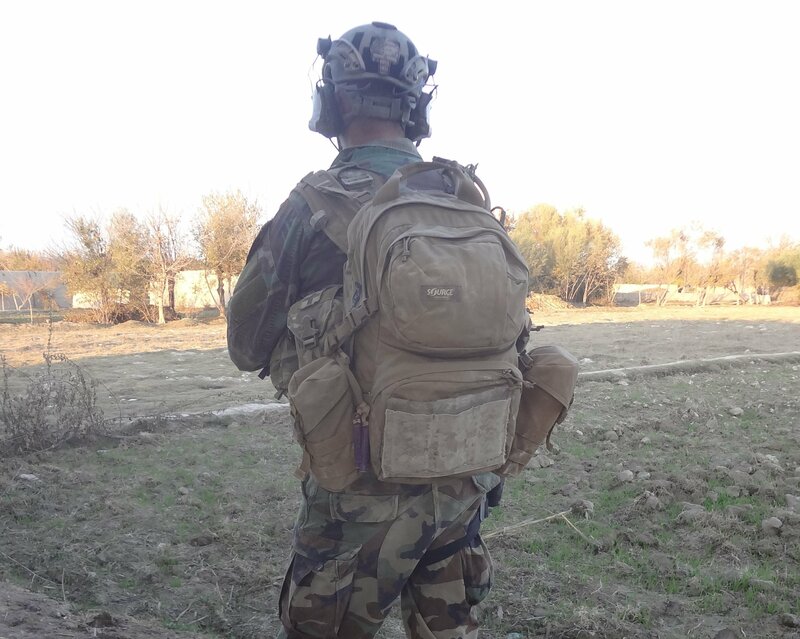 While wearing a pack over body armor, depending on how you rig up your kit, there is often no room for a waist belt. In my case, I wear a pretty robust war belt along with my plate carrier. There is just no way to buckle the waist strap around everything. 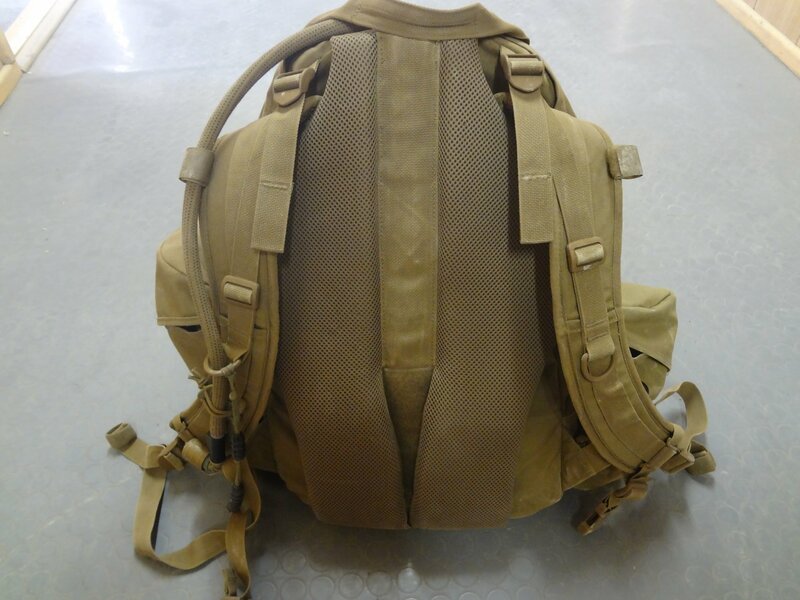 With a good sternum strap, which the Patrol 35L has, I found that it, along with the already mentioned design of the shoulder straps, was enough to keep the pack centered on the back of my carrier. As I have previously mentioned, I attached two 5.11 Tactical H2O Carrier Nalgene bottle pouches (one to each side). I like to rig water bottle holders to the sides of most of the packs I use. They’re not just for Nalgene water bottles. I find the water bottle-sized pouches perfect for holding holding other items like flares, smoke grenades, spare ammo, or anything else I want to have quick access to on the outside of the pack. To help carry spare M4 mags, I attached a Blue Force Gear BFG Ten-Speed Triple M4 Mag Pouch to the bottom out pocket. The Ten-Speed pouch allowed three spare mags while still maintaining a well contoured profile to the outside of the pack. The Patrol 35L has enough room in it for everything I need to carry for a 24-48hr operation in the fall weather of Afghanistan. With temperatures going from the 70s during the day to mid-30s at night, I have the requirement to carry both plenty of water and snivel gear if I want to be comfortable at night. 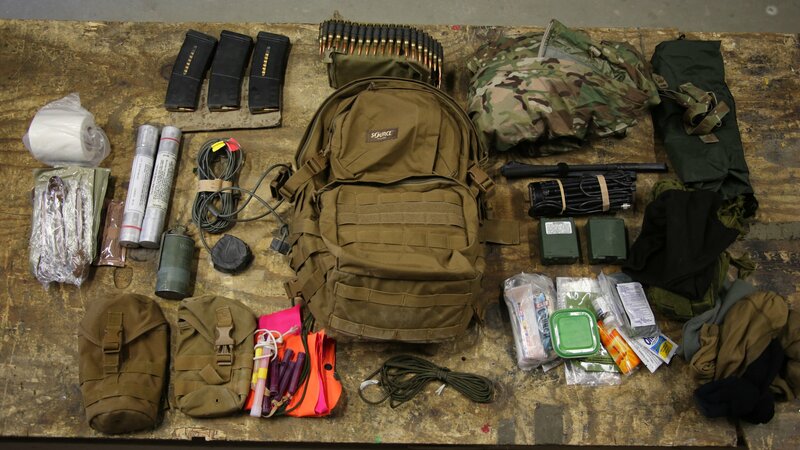 Spare ammunition, food, marking devices, extra clothing and cold weather gear. The Patrol 35L easily fits everything you might need to carry to sustain yourself for an extended operation. Patrol 35L after two trips to the field. Aside from being covered in some dirt, pack is holding up great! My only critique of the Patrol 35L is its lack of quick-release buckles on the shoulder straps. For a military pack, quick release buckles are a must, in my opinion. You don’t want to be fighting trying to manipulate your pack off your shoulders if you happen to get into a situation where you need to fire and maneuver quickly. Notice lack of quick release buckles in the shoulder straps. For a military pack, this is the only improvement I can see the Patrol 35L needing. Let’s face it, if you have ever worn a pack over body armor with a full combat loadout, then you know full well that it’s rarely a pleasant experience. I’ve found the Source Patrol 35L Hydration Cargo Pack to be the most comfortable 3-day pack I’ve ever used. If your mission, factored with duration, terrain, and weather, dictate that you need to carry enough gear to sustain you for 24hrs or more, then I suggest you give the Patrol 35L a serious look. I’d loan you mine, but I like it too much. Editors Note: This and previous articles here on DR are the author’s sole opinion and not endorsed by SOF, the U.S. Army or the U.S. Government. © Copyright 2015 DefenseReview.com and Jeff Gurwitch. All rights reserved. This material may not be published, broadcast, rewritten or redistributed without receiving permission and providing proper credit and appropriate links. All photo content contained in this article was shot by Jeff Gurwitch for DefenseReview.com, and is copyrighted. DefenseReview.com and Jeff Gurwitch own the copyright on all photo and video content. Previous: Will AI (Artificial Intelligence) and Super-Intelligent Robot Soldiers Save Us, or Kill Us? Next: DRD Tactical KIVAARI, Paratus and CDR-15 Backpackable/Manpackable Quick-Takedown Semi-Auto Tactical AR Rifle/Carbines Get New Nickel-Boron (NiB) Battle Worn Finish!